The Stratford Festival production of "The King and I" is spectacular--spectacular to the point of lunacy. While the human drama at the heart of this classic musical does peep out, it has to struggle through a production revelling in its own excess. The national touring production that played at the O'Keefe Centre in 1997, designed by the same designer and featuring some of the same personnel but directed by Christopher renshaw, was much more satisfying because it was simpler and staged on a much more human scale. The current production suffers from two major flaws. The first and perhaps the most disappointing is that Lucy Peacock as Anna Leonowens, the British woman who became the tutor of the children of the King of Siam, can't sing. Her acting is excellent. She shows the subtle change in character in this strong-willed woman from the prig we first meet to someone who has come to respect the alien culture she finds herself in. She shows how Leonowens' abhorrence of the king gradually turns to something akin to love. If this were the play "Anna and the King of Siam" on which the musical is based everything would be fine. However, this is a musical and one of the greatest written by Rodgers and Hammerstein. Peacock's voice would not get her kicked out of a church choir but it never get her promoted to soloist. The string of hits written originally for Gertrude Lawrence--"Whistle a Happy Tune", "Hello Young Lovers", "Getting to Know You" and "Shall We Dance?" --never crystallize the show's energy as they should in Peacock's thin, short-breathed, fluttering renditions. Only "Shall I Tell You What I Think of You" succeeds because it involves more talking to music than singing. The problem is all the more noticeable since everyone else in the show, including Ian McLennan, who plays her young son, has stronger voices than she does. One wonders why the Festival would mount such an extravagant production without the right actor for the central character. The second major problem is Debra Hanson's gigantic set. Yes, it is impressive when it is far-too-laboriously unveiled, but over the course of three hours it is not a neutral enough background for the various locations of the action. It makes all the scenes seem to occur in the throne room. The two oversized gold-and-blue statues of deities supporting the roof beam literally dwarf the actors and irritatingly distract attention away from the stage. The stage floor itself is elaborately painted to look like the lid of a lacquer box. Hanson's colours and patterns seem to have been designed with no concern for how they would work with Roger Kirk's extraordinarily beautiful costumes. Kirk, who designed the Australian production that stopped in Toronto between Broadway and the West End, uses a palette of pastels that clash more often than not with the colours of the set. The set is so busily ornamented it makes it difficult to appreciate the exquisite detail of the costumes or some of the patterns of Kevin Fraser's lighting. In such an obviously expensive production, why did the director, Susan H, Schulman, not take action to prevent the set and costumes from being at war? The production also involves a great deal of waste. There are innumerable unnecessary costume changes for both main characters and extras to the point where they come to distract from the focus of the drama itself. No matter where a show is set, the focus should be on the people wearing the costumes not on the costumes themselves. Reams of satin and cloth-of-gold are fine but, people singing and acting is, I hope, what we come to see in the theatre. These flaws are a pity since so much of the production is so near perfection. Victor Talmadge creates a very sympathetic portrait of the King as a man caught between his own prejudices and the reforms he wants to bring his country but does not fully understand. His songs are all the stronger for being sung rather than spoken to music as is so often the case. The "young lovers", Anne Marie Ramos as Tuptim and Charles Azulay as Lun Tha, both have strong, trained voices. But it is Helen Yu as Lady Thiang who provides the musical highlight of the evening with her rapt account of "Something Wonderful". Among the others Thom Allison is powerful presence as the Kralahome while Robert Hamilton is far too weak as Sir Edward Ramsay, a man who loved Anna in the past. Sir Edward represents the kind of secure life that Anna is foregoing by living in Siam and must appear as a strong figure for her sacrifice to have weight. Tuptim's dance-drama "The Small House of Uncle Thomas" is a masterpiece in itself and is staged beautifully by choreographer Michael Lichtefeld. Karla Jang gives a stunning performance as Eliza but indeed the whole corps of dancers is marvelous. The cute troupe of children playing some of the king's numerous offspring give alert, professional performances. 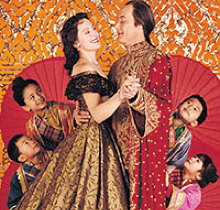 "The King and I" will undoubtedly be the hit of the season. With better casting of the central role and more coordination between the designers the show might have reached perfection. As it is, the show's core of human drama is nearly smothered under physical opulence. Photo: Lucy Peacock and Victor Talmadge with children. ©2003 Stratford Festival.